Hand carved bone beads, Mexican onyx, red jasper, coconut and black onyx beads with brass Abija beads. 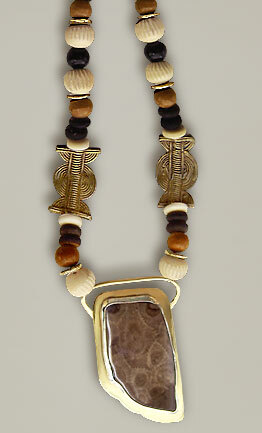 One-of-a-kind necklace with brass fittings and a Petoskey stone cabochon. Pendant ~ 2 1/2" x 1 1/4". 24" of Beads. Total length = 26 1/2". Custom order available in different lengths.